Monday’s great deal has ended…hope you caught it while it lasted. We never order out pizza. In fact, this past week, was the first time ever and paying to order pizza to go. It was for my daughter’s basketball party and I SO wish I would have had this Groupon because I actually ordered it from Domino’s and paid WAY more than this for just pepperoni. So, this is going to be a really special treat. I just ordered mine (well, I actually ordered three), and that means a few easy nights of no cooking sometime soon. 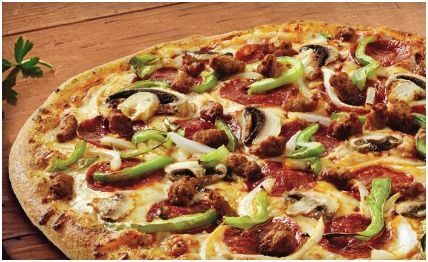 With this Groupon, enjoy one large any topping pizza (up to $20 value) for only $8. That’s up to TEN TOPPINGS, and one heavy pizza – woot! If you’re new to Groupon, sign up here. Remember when you sign up to choose the closest town to you. Those emails will be for your daily deals, but don’t worry, many Groupons are national deals, like this one, which allows you to use your groupon nationwide. If you are already a Groupon member, go straight to the Domino’s Deal and purchase.